It’s been raining quite a lot for the past few days and one of the best things to drink during this weather is definitely hot chocolate! Below now is a recipe for homemade Spanish Hot Chocolate which I was able to taste from a friend’s house the other day. I’ll definitely try making this one of these days. Melt the sweet chocolate over low heat. Stir in the milk and cinnamon when chocolate has dissolved. Add the eggs and beat the mixture until it becomes thick, taking care not to bring it to a boil. 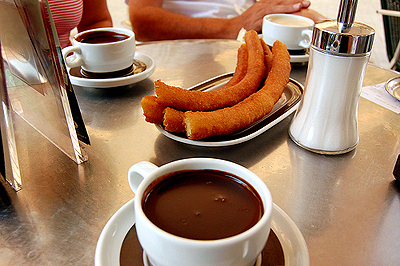 Best served with churros. Makes 3 cups. nothing beats hot drinks in cold season, like hot choco with marshmallow on top and latte with cinamon! What, sure you have compared churros and marshmallow. Muahahahaha. NOPE. Good churros have no rival.